Suburban Strut: Wine Love...not what you are thinking! Back today with another great Fall outfit for #ssholidayglow!! I think this dress, cardi, and bootie combo would be perfect for a Fall banquet, date night, a night at the theater, or any dressy event! You could also add tights or leggings if you are not wanting to bare leg. You could get this same look with any flowy dress, cardigan, and booties - just don't be afraid of fall colors and layering up! 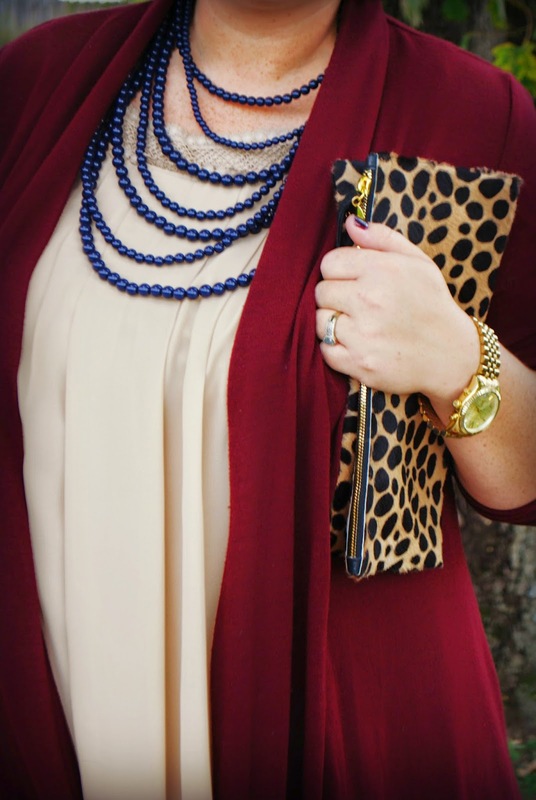 I LOVE the burgundy/wine/maroon/oxblood color family and I think it perfect for this time of year. You will be shocked at how much you can wear it with because it is so versatile. I linked a great, affordable Old Navy cardigan in wine...and those booties are fabulous!!! The dress and necklace are both from Logo and Stitch - now called L&S Boutique because they have expanded and will be carrying more clothes AND RELAUNCHING THEIR WEBSITE!!!! HOLLA!!! This dress is so pretty and flowy - it is Umgee and you need to size down. They have it in all sizes, including plus. It has big flowy, short sleeves so it can be worn year round too. I wanted to add the cardigan and booties so it would feel more "Fall-ish" and work for a cool evening.